A film with funny women? 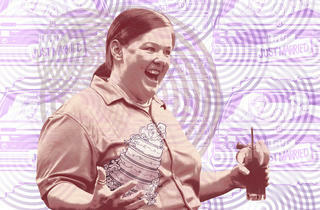 Yes, please, says Melissa McCarthy of Kristen Wiig’s Bridesmaids. In Bridesmaids, when Maya Rudolph’s Lillian asks her childhood pal, Kristen Wiig’s Annie, to be her maid of honor, Annie finds a rival in Lillian’s new friend Helen (Rose Byrne). Penned by Wiig and fellow Groundlings member Annie Mumolo, the comedy boasts numerous headliners (Jon Hamm as Annie’s himbo, the late Jill Clayburgh as her mom), but the scene-stealer is an actor from Plainfield. Melissa McCarthy (Mike & Molly) plays the aggressively lusty, supremely self-assured Megan. Along with Wiig, McCarthy recently stopped in town. Your husband, Ben Falcone, plays your love interest here. What was your and Ben’s own wedding like? My sister was my maid of honor, and I had one girlfriend, Lisa, and then the rest were all guys. I had bridesmen. Any awkward competitiveness among them, like in the movie? So what did you do for the party? I always said my version of hell would be some huge stretch Hummer. And so they got that. Somebody made a fantastic mix-tape of all your shame music, like, Erasure from the ’80s, and [Laughs] we went to this karaoke bar and danced and sang our hearts out all night. And drank lots of tequila. How was growing up in Plainfield? I grew up on a farm two miles outside of Main Street. I go see where our farm is, and now it’s a subdivision. Would you make it into the city? Once I hit high school. My dad’s like, “I moved us out into the middle of nowhere to keep you out of the city.” He grew up in Hyde Park. I was really looking for an outlet. I wanted to be more creative, and I was really gothic. There wasn’t a lot of artistic things going on in Plainfield, shockingly, so I did it through dress. We’d go to the Metro, and lots of sneaking in, lots of wristband trading. We were 16 and looked 12. And then we’d go to Smart Bar and—God, what was my favorite place? It’s a German city. Oh, Berlin! Berlin—so you had a lot of gay friends growing up? Totally. It was always me and, like, eight gay guys. All the guys at my wedding. People were shocked I had any women. They were like, “You do have female friends!” I’m like, “I can do it. One is my sister, but I can do it.” I’ve always had mostly gay male friends. Were they also your creative outlet? I think so. When we’d go into the city, it was the only time people could be who they truly were. I graduated high school in ’88, so this was, like, ’84? ’85? My friends had to really watch it. It was just a whole different time. 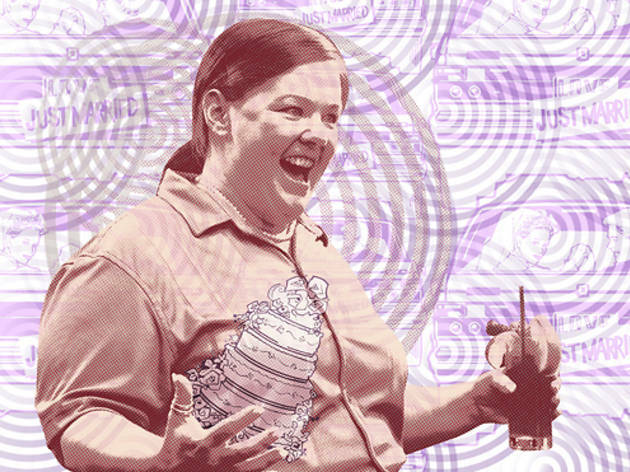 It’s rare how Bridesmaids as a mainstream comedy depicts women who are sexually active without being punished for it, or without that being the punch line. Everything about this seemed rare to me. It seemed rare to have characters that were female that weren’t stereotypes and were actually funny. So often you see female characters that are, you know, [Girlishly] all fighting about nail polish! I’m like, well, I’ve never done that in my life, I don’t know any women that do that—God bless them if they do. Yeah, it’s like they’re all single women for the most part—of course there’s a sexual side to you. It’s also unusual that you’re a heavy woman in a comedy yet that’s not used as a punch line, either. Yeah, it’s like, I’m heavy—that wasn’t part of the character. Once you start writing a character visually, you’re in trouble. Do you see that a lot, those roles where they’re just looking for a plus-size woman? They’re always looking for that. There’s always some dingbat that’s like, “I’ve got a part for you.” And I think, You haven’t written a part. You’ve written a sight gag. Yeah, and that stuff I don’t do. Mike & Molly is the first time I’ve ever done anything weight related, and the only reason I took that is I loved that it was a love story. The weight was a secondary thing. But for this movie, it had nothing to do with it. There was a reviewer who I’d like to throttle that said that I was playing an overweight—and I was like, “Oh, I’m playing it. I must be amazing!” As if at the end of the day, I unzip it and I’m, you know, size six. I wish.